Prepare and put the shellfish in a saucepan with the sherry and half the garlic, cover and set over a medium heat. Bring to a simmer and cook for 3-4 minutes until all the shellfish are open. Discard any that don't open. Strain off the cooking liquid and reserve, keeping the shellfish in the pan, covered, while you prepare the rest of the paella. Heat the olive oil in a frying pan over a medium heat and fry the onion and pepper until soft but not coloured (about 10 minutes.) Add the remaining garlic, cook for 1 minute then stir in the tomatoes and cook for 2-3 minutes to soften slightly. Add the rice and stir well. Add the stock, reserved shellfish cooking liquid, saffron and 1 tsp salt and set over a medium heat. Bring to a simmer, reduce the heat and gently simmer for 30 minutes, stirring occasionally. Add the petits pois for the last 5 minutes. Adjust the seasoning. 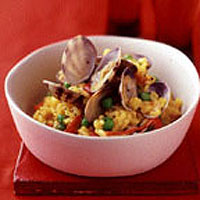 Transfer to a warmed dish, top with the shellfish, drizzle over the vinegar and serve.